We’ve heard of Portobello mushroom burgers, and we’ve heard of Eggplant Parmesan… but have you ever heard of Portobello Parmesan? Furthermore, what about putting in on a burger? This is where experimentation lands you. After scouring my pantry and refrigerator one night and only finding a hodgepodge of ingredients, I knew I would have to get creative. This deliciously light recipe is perfect for Summer. You can make the Portobello Parmesan alone, or stick it on a burger and pair it with fries like I did. Read on for the recipe. 1) Position a baking rack in upper third of oven. Preheat oven to 400 degrees F. Line a 17-1/2 x 11-3/4 baking sheet with aluminum foil. Place a 16-1/2 x 11-1/2-inch wire cooling rack inside the baking sheet. Mist rack with cooking spray. Set aside. 2) Combine bread crumbs, 1/2 cup Parmesan cheese, 3 tablespoons parsley, paprika and 1 teaspoon salt in a shallow pan. Mix well. Set aside. 3) In a separate bowl, combine egg substitute, remaining 1 teaspoon salt. pepper, marjoram, garlic powder and oregano. Mix well. 4) Dip both sides of mushrooms into egg mixture. Dredge in crumb mixture until both sides are completely coated. Transfer, stem side down, to prepared wire rack. Spray tops with cooking spray and bake for 15 to 20 minutes, or until mushrooms are tender. Remove pan form oven. 5) Reset oven thermostat to 450 degrees F. Meanwhile, carefully turn mushrooms stem side up. 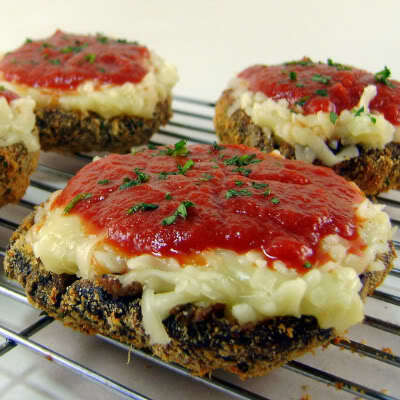 Cover each mushroom with 2 tablespoons of remaining Parmesan cheese, 1/4 of mozzarella cheese and 1/4 cup tomato sauce. Spray tops lightly. Return to oven and bake until cheese melts and mushrooms are warmed through, about 10 minutes. Use a wide spatula to transfer mushrooms to a serving platter. Sprinkle with reserved 1 tablespoon parsley. 6) Plop that sucker on a bun and side it with baked fries of your choice. 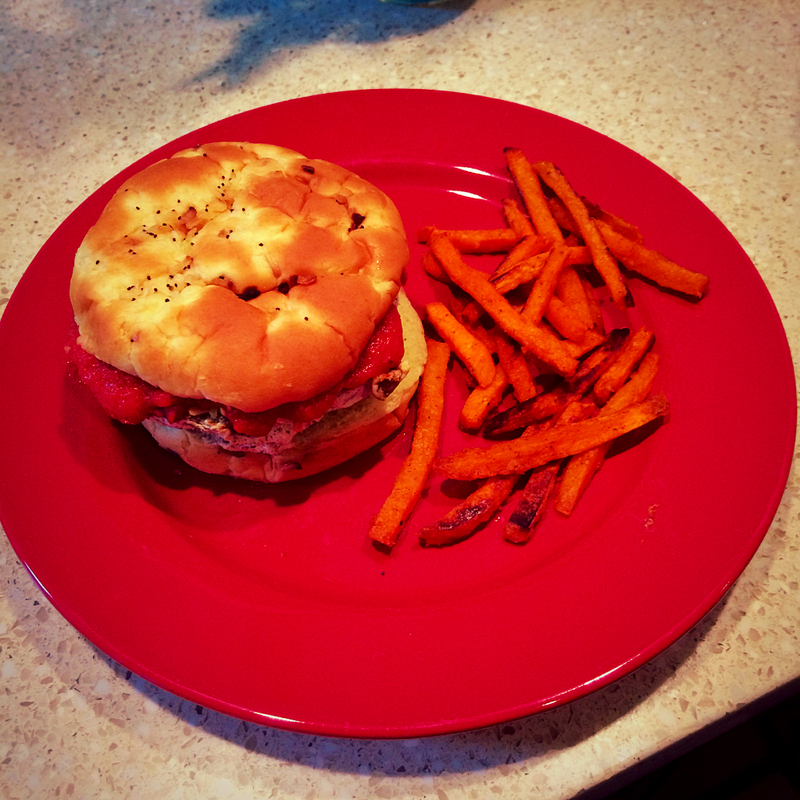 I used spicy sweet potato fries.